Low-top elevator sneaker featuring upper in white full-grain leather enriched with cobalt blue suede details on the heel tab. 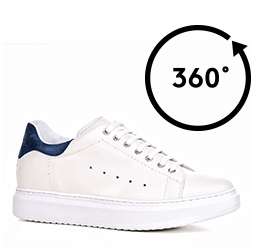 The white sole is made of natural rubber. An extremely cool and timeless handcrafted sneaker with an inner elevator system able to increase height by 2.6 inches (6.5 cm).